Fresh lemons as required for basting. On the skin side of the fillet make two incisions in the skin where the meat is its thickest. This will ensure that heat reaches the thickest region of the fish. Heat BBQ to high setting and preferably use a grill not a plate. Cooking time 15-20 min subject to type of BBQ. Place fish on BBQ skin side down. Add salt, butter, squeeze of lemon and herbs/spices. The addition of butter, lemon and herbs/spices can be repeated as desired. After 10-15 min, grip the fish lengthwise with a tong and wiggle it to remove the skin. It parts easily if the BBQ was hot enough. Skin can be kept and flipped to create tasty crispy skin. Make sure the fish is kept on the skin side to seal it then rotate and add more salt, butter and lemon. Monitor until cooked. Note - do not overcook salmon as it is best served rare. Note: Your salmon can be pan fried or oven baked if preferred. Wash the potatoes very well removing any soil. Boil the potatoes for 20 minutes in salty water over the stove. Preheat the oven to 220°C or 200 if fan forced. Remove the potatoes from the boiling water and leave to cool for a few minutes. Peel (optional) and slice the potatoes into ~ 6 chip slices. With a fork scrape along all the sides of the potatoes to roughen up the sides. This will allow the oil and salt to go into the crevasses for extra flavour and help crisp the chip. Drizzle olive oil over the potatoes and sprinkle with sea salt. Now you can also add in your fresh herbs or sprinkle paprika if you choose. Toss to coat the potatoes. Place the potatoes in a tray lined with backing paper and put into the oven for 20-30 minutes. Turn the grill on for the last 5 minutes to give them and extra golden colour. 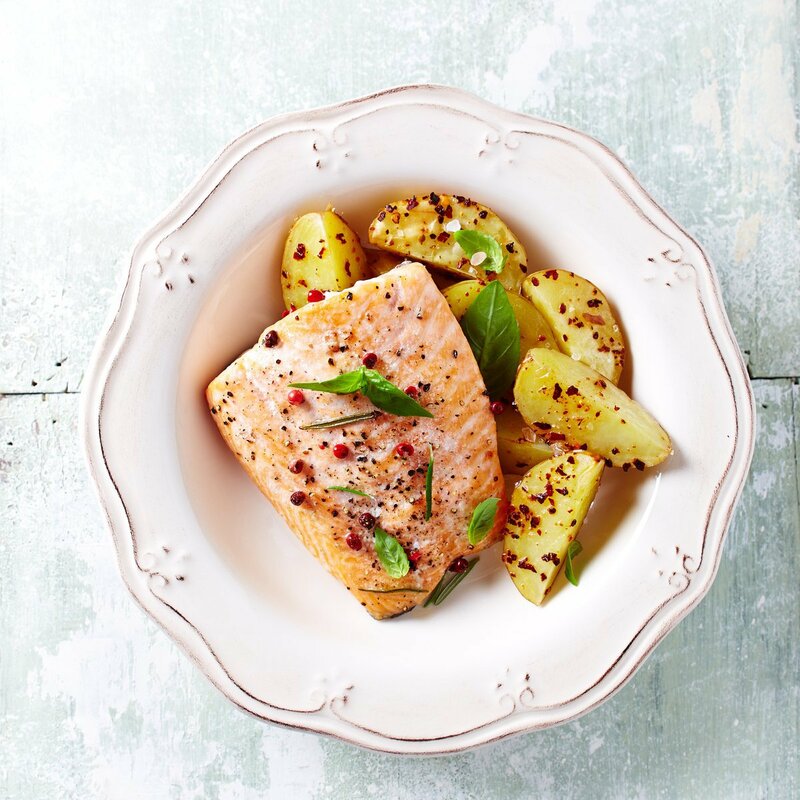 Serve the barbequed Salmon and roasted potatoes with a fresh green salad.